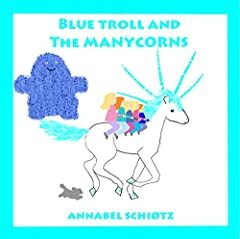 One day, when Blue Troll is out walking in the woods where he lives, he finds a family of manycorns. Manycorns are very beautiful animals, they are shining white, with flowing, turquoise manes and tails. They look a bit like unicorns, but they have five horns instead of only one, which is, of course, why they are called manycorns. But something is not right, the mother manycorn is unable to get up, and when Blue Troll realises why, he needs to find help as fast as he can.